Right about the time I was making the Puerto Rican Flag, the need for a painting rack arose. I decided to build one out of scrap I had laying around. 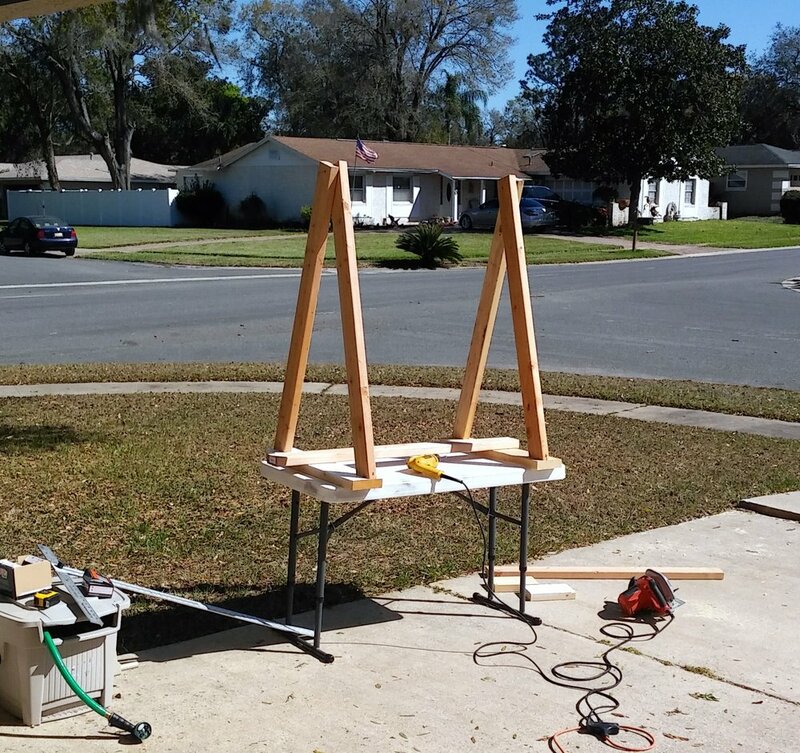 First I built two simple A-frames out of 2x4's and 2x6's (for the bottom). Used some random 1x4's from what looks like a concrete walkway project left from previous owners to connect the A-frames plus a couple of 2x4's on the bottom. Total length was about 42-44 inches. Didn't have a handle laying around, so made one out of a short 2x4 piece screwed to a piece of plywood. I wanted the rack portable, but didn't feel like driving to the store or spending money on a project I wasn't sure was going to work - I cut out my own wheels with a jigsaw. The other benefit of these DIY wheels was the sweet-sweet medieval look. Used the lag bolts I've had from securing the pull-up bars to wooden studs years ago, conveniently painted brown on the edge already. Somehow I had a couple extra cans of blue spray paint, that is rarely used (and only a little bit of black, which was the color I wanted) - rattle canned the entire rack blue. The wheels gave me an idea to add a little flair to the rack just for kicks. Mocking up the viking style wolf head (made a notched holder out of plywood to make it upright and screwed to the A-frame). All cut out and dremeled out (only on one side, the other side is flat). I put some short screws into the horizontal 1x4's to hang stuff, but found that just laying doodles across worked better while drying. The blue didn't quite work for me, so later on I had some spare black paint - sprayed the majority of the rack. Much better! Filled the dremeled out blue lines by hand for that fancy Medieval Chic look. In the end I took the rack apart after a couple of months - didn't end up needing it as much and decided on a new structure instead. Kept the wolf head though, because it's awesome, just don't know what to do with it yet.